Extensive systems of fossilized riverbeds have been discovered on an ancient region of the Martian surface, supporting the idea that the now cold and dry Red Planet had a warm and wet climate about 4 billion years ago. The University College London research identified over 17,000 kilometers of former river channels on a northern plain called Arabia Terra, providing further evidence of water once flowing on Mars. “Climate models of early Mars predict rain in Arabia Terra and until now there was little geological evidence on the surface to support this theory. This led some to believe that Mars was never warm and wet but was a largely frozen planet, covered in ice-sheets and glaciers. We’ve now found evidence of extensive river systems in the area which supports the idea that Mars was warm and wet, providing a more favorable environment for life than a cold, dry planet,” explained lead author, Joel Davis (UCL Earth Sciences). Since the 1970s, scientists have identified valleys and channels on Mars which they think were carved out and eroded by rain and surface runoff, just like on Earth. Similar structures had not been seen on Arabia Terra until the team analysed high resolution imagery from NASA’s Mars Reconnaissance Orbiter (MRO) spacecraft. The new study examined images covering an area roughly the size of Brazil at a much higher resolution than was previously possible – 6 meters per pixel compared to 100 meters per pixel. While a few valleys were identified, the team revealed the existence of many systems of fossilized riverbeds which are visible as inverted channels spread across the Arabia Terra plain (below). The inverted channels are similar to those found elsewhere on Mars and Earth. They are made of sand and gravel deposited by a river and when the river becomes dry, the channels are left upstanding as the surrounding material erodes. On Earth, inverted channels often occur in dry, desert environments like Oman, Egypt, or Utah, where erosion rates are low – in most other environments, the channels are worn away before they can become inverted. “The networks of inverted channels in Arabia Terra are about 30m high and up to 1-2km wide, so we think they are probably the remains of giant rivers that flowed billions of years ago. Arabia Terra was essentially one massive flood plain bordering the highlands and lowlands of Mars. We think the rivers were active 3.9-3.7 billion years ago, but gradually dried up before being rapidly buried and protected for billions of years, potentially preserving any ancient biological material that might have been present,” added Joel Davis. 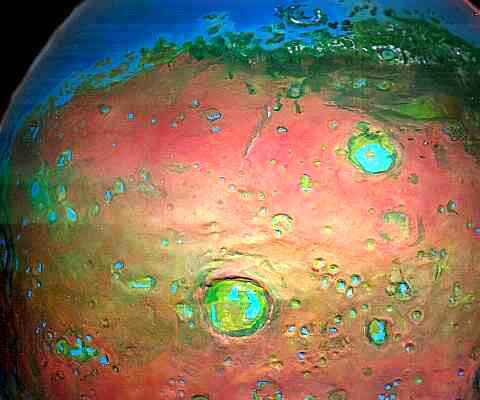 “These ancient Martian flood plains would be great places to explore to search for evidence of past life. In fact, one of these inverted channels called Aram Dorsum is a candidate landing site for the European Space Agency’s ExoMars Rover mission, which will launch in 2020,” said Dr Matthew Balme, Senior Lecturer at The Open University and co-author of the study.